Easy Air Fryer Meatballs turn out as crispy as you remember your Grandmother’s fried meatballs! Air Fryer Meatballs are done in about 10 minutes and are so tasty! Are Air Fried Foods Healthier for You? If you have been keeping up with my air fryer education, you know that I have been trying all kinds of delicious foods in my air fryer, since Christmas! So far, I have made, Air Fyrer Chicken Wings, Air Fryer Pork Loin, Air Fryer Doughnuts and now these Air Fryer Meatballs! 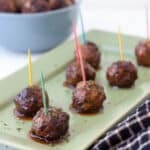 I have made these air fryer meatballs with this Sweet and Sour Sauce and my old favorite, one of my most requested appetizers, this Cranberry Orange Sauce! These meatballs are the first thing that disappear when I take them to a potluck! Noone can resist them! The air fryer is, without a doubt, one of the best kitchen tools I have added in decades! So, I will take you along on this journey to perfect cooking in the air fryer. Preheating the air fryer gives you a crispier outside with little, or no added oil. Use no stick spray, instead of oil, so that you can control the amount of fat in your food. Spray the inside of your air fryer with no stick, or wipe it with oil on paper towel, for easy cleanup. Some foods need no added oil, such as; Air Fryer Doughnuts and these Air Fryer Meatballs. Line tray with aluminum foil for easy cleanup. Always spray rack with non stick spray, for easy cleanup. Use higher temperatures for quick cooking foods and lower temperatures for slower food. Cut foods in uniform sizes for more even cooking. Air Fried Foods contain less fat than traditionally fried foods. In this fact alone, air fried foods contain less fat and calories, than traditionally fried foods. Air fried foods can also aid in weight loss! Here is an interesting article that will walk you through the science of air frying foods! Grate onion directly over meat to capture the juices. Add eggs, breadcrumbs and spices to meat. If making meatballs for Italian sauce, add Parmesan cheese. Form into balls. An ice cream scoop or cookie scoop works well to portion meat. Place on rack. This sauce is a delicious sweet and sour sauce that utilizes apricot preserves. Just add all of the ingredients to a saucepan, bring to boil. Then reduce heat and simmer until thickened! Air frying meatballs has become my favorite way to cook meatballs! Years ago I switched from pan frying meatballs to baking meatballs. I appreciated the fact the baked meatballs turned out more round than pan frying, but I did sacrifice a bit on flavor and crispiness. No longer, my friends! These air fryer meatballs are so much crispier than baked! I am now doing a happy dance in the kitchen!  ! Thanks for stopping by to check out this tasty recipe for Air Fryer Meatballs! Whichever sauce you pick, you will not be sorry that you tried these! Easy Air Fryer Meatballs turn out as crispy as you remember your Grandmother's fried meatballs! Air Fryer Meatballs are done in about 10 minutes and are so tasty! Grate onion and garlic right over bowl with the meat in it. Whisk eggs. Add the rest of ingredients to bowl and mix, gently, but well by hand. Form meatballs. For dinner meatballs, portion meat with ice cream scoop. For appetizer meatballs, portion with cookie scoop. Place on air fryer basket, so the meatballs are not touching. Air Fry at 400°F for about 5-6 minutes, until browned. Carefully remove from air fryer and flip with tongs. Continue to air fry about 5-6 more minutes, until browned and temperature is over 165°F. Grate onion and garlic directly over small pot. Add remaining ingredients. Bring to boil. Reduce heat to very low. Cook, stirring occasionally, about 1 hour, until sauce is thickened. My husband got me an air fryer for Christmas, so I have been trying to figure it out! Going pretty well so far! I love the sound of this sauce! Interesting how you grate the onion in the meat. I have been grating the onion and garlic in the meat bowl for many years! Thanks Kim, let me know how you like the sauce! These look awesome! I haven’t used my air fryer nearly enough since I got it, so I think I need to add these to my list and make them ASAP! I am really loving my air fryer! Let me know how you like them when you give them a try! Thanks Sues! Grated onion keeps the meatballs so tender. Just delicious! Agreed! I love using the grated onion! Thanks for stopping by Tara! I think the Air Fryer is the single best kitchen gadget (outside of a stand mixer) and we have used ours non-stop. These meatballs have my stomach growling! I love it too! Maybe you are just hungry? 🙂 Thank you Rae! Haha! Thank you! The podcast episode was a lot of fun! I’m glad you enjoyed it! I love my air fryer too! Thank you Valentina! I haven’t got an air fryer just yet but the more recipes I read that look so good like this one the more inclined I am to add this gadget to the top of the birthday list. I felt the same way, and I love it! It is so fun! Go for it Alisa! Thanks! Have a great weekend! I love the look of that sauce and the flavours in the meatballs sound fantastic. Thank you Brian! We are crazy about this sauce! I need to try this! I got an air fryer for Christmas and I love the chips in it and I’ve made some great chicken nuggets so meatballs have to be soon on the list! They are really very good, Corina! You will like them! Thanks! That is definitely a challenge! This one is large so I had to move a few things around! Thanks for the comment Laura! LOVE your presentation and how juicy these meatballs looks. DELICIOUS! Thank you Immaculate! They are quite juicy cooked in the air fryer! Thanks Ramona! I’m so glad you enjoyed the meatballs! The sauce is yummy! The kids will love it!